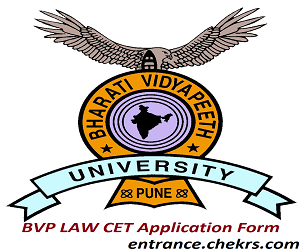 BVP LAW CET Application Form (बीवीपी लॉ सीईटी आवेदन पत्र) 2018: We are here with a good news that the Bharati Vidyapeeth University has released the BVP Law Entrance Test 2018 Notification at its official website. 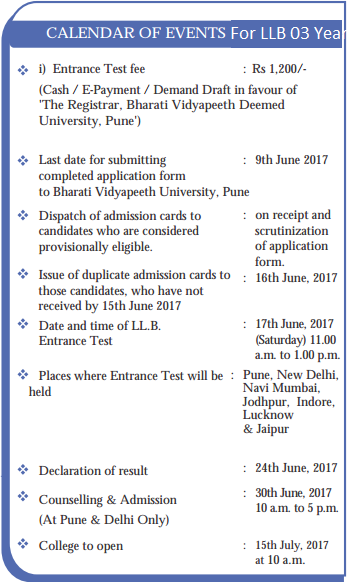 It has invited the BVP Law Entrance Test Application Form 2018 from the candidates meeting the eligibility in all the aspects in both online as well as offline mode. BVP CET Law Entrance Test is conducted for enrolling the deserving and willing candidates into the BVP university classroom Law ( in BA LLB, BBA LLB and LLB) programs. Candidates need to submit the completely filled applications on or before the last date, i.e. June 2018. 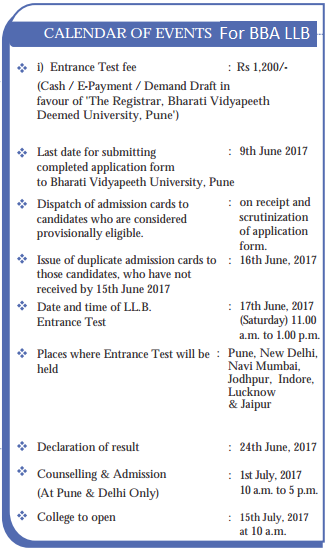 Candidates can fill the BVP CET Law Application form 2018 by following the online procedure given below or they can do so in offline mode also by submitting the completely filled application form along with all the necessary attachments after downloading it from the official website, to the given address until the last date. The applications for Bharati Vidyapeeth Deemed University will be accepted in both online as well as the offline mode. Candidates need to satisfy the eligibility norms in all the aspects as mentioned above before submitting the BVP Law Entrance Exam Application Form 2018. For online application submission, candidates need to fill the online form after following the procedure given here and in the case of offline application submission, candidates need to download the application form from the official website and the duly filled BVP Law CET Application Form 2018 need to be submitted to the given address on or before the last date, i.e. June 2018. Without submitting the application form on time, no aspirants will be allowed to participate in AVP Law admission process. Visit the official website of Bharati Vidyapeeth University, i.e. bvuniversity.edu.in/. Make an online registration by fill the personal details and create user id and password. Login to the website by registered id and password. Read instructions carefully of fill online form. Fill the application form carefully and upload documents by scan copy with recent photograph and sign. Recheck form and hit the submit key. Take a hard copy of application form by print out for further need. Candidates need to collect the application form from the CET office in person. Attach the necessary attachments and application fee receipt with it. Submit the duly application form to the given address in person or by post. Candidates should have completed their bachelor degree in any of the discipline. Candidates age should not be more than 30 years (35 years for reserved categories). The application fee will be Rs. 1200/- that can be pay by the online mode (debit card/ credit card/ net banking) / offline mode (By demand Draft). Without the fee, exam community will not accept the application form of any applicant. We are here to inform the candidates waiting for the commencement of application submission for BVP LLB Entrance Exam 2018. Applications can be submitted in both the modes, i.e. Online as well as Offline. The submission of BVP LLB Entrance Exam Application Form 2018 has been started from January 2018 and the candidates are advised to submit their applications in their preferred mode on or before May 2018. 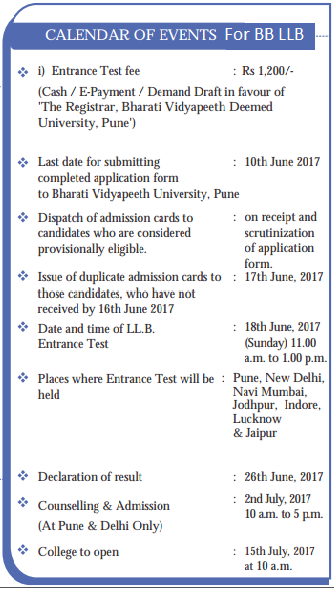 After the submission of BVP LAW CET Application Form 2018, candidates will have to appear in the law entrance exam on May 2018. For any type of assistance, while applying for BVP CET LLB Application Form 2018, you are invited to contact us by leaving your issues at the end of the post, we will respond you as soon as possible.